Although I’m Portuguese, these days I often think in English. It feels odd to write about Leipzig in English, for Leipzig is the place where I learned to speak German (properly). Yes – although I’d thought my painful four years of Unterrichte back home were enough to communicate, and although I’ve been told by many Wessis that one doesn’t learn German im Osten, I did learn German thanks to life in Leipzig. History and habits aside, Leipzig was also my introduction to life abroad. I was 21 years old, almost nine years ago now. After my exchange year as an Erasmus student I lived im Westen for another while, and I worked in Brussels and Geneva before landing in frantic London, the city where I now realise I’ve been living a rushed life for a handful of years. But none of these years was as special as the first. 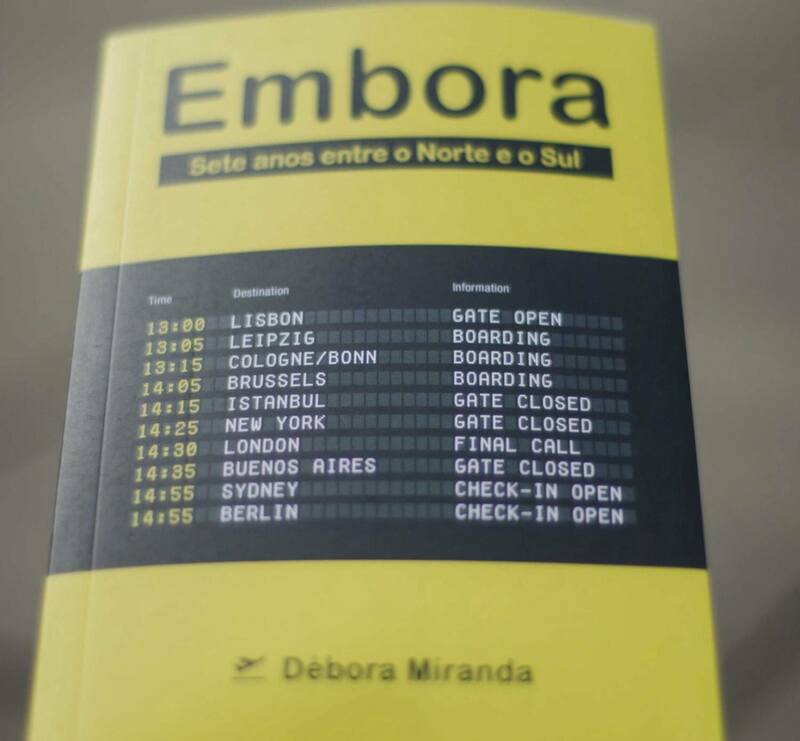 I recently went back to Leipzig, conveniently dragged by a trip to Berlin where I presented my first published book, in Portuguese: Embora – Sete anos entre o Norte e o Sul. I couldn’t help but stop by this very special town, especially as I could now visit a friend I’d met in Geneva. The same friend who now happens to live in Leipzig and run this amazing project, LeipGlo. We wandered around, sharing the affection we both feel for Leipzig despite the five-year gap between our experiences. Back then, the Universitäetsgebäude was an old soviet-style block, which people were sad to hear would be replaced by some ugly modern building. But this time, as I arrived at Augustusplatz, I remembered the same square where I witnessed one of the first culture shocks as my new Dutch friend looked furious at our Brazilian friend arriving “only” 15 minutes late. And I then saw the modern building. Although it’s not my building anymore, I smiled. It looks very pretty to me, perhaps because I learned a lot right there. 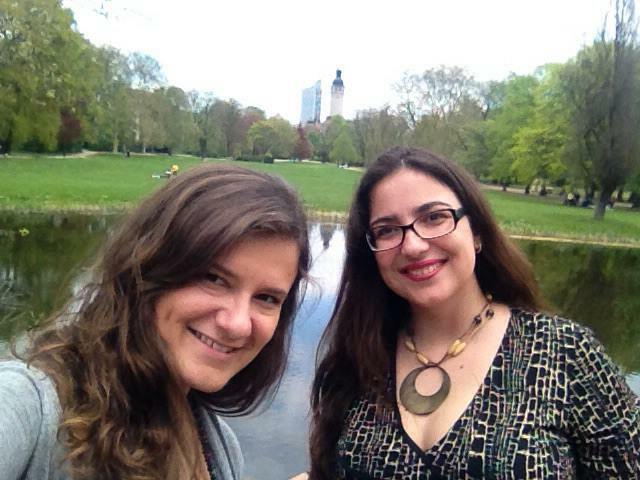 Débora and Ana Beatriz Ribeiro, editor of The Leipzig Glocal, at Leipzig’s Johannapark, where Débora once memorably celebrated her birthday. Photo by D. Miranda. The book is a collection of blog posts that I wrote over the course of seven years, two thirds of which describe my memories of Germany, with its places, people, lessons, adventures, vocabulary and a much stronger appreciation for the non-translatable Portuguese word saudade. As time went by – especially in London, where it goes by far too fast – I began to write less and less. It wasn’t new anymore. Meetings with Frau X or Y to book Termine became the routine. Opening a bank account wasn’t a barrier anymore. Sitting at a table for dinner with a dozen friends all owning a different native language became normal. Eighteen degrees became my threshold for summer. Drinking from heavy glasses of beer became obvious (and regular). My bike became my friend. Flights became a regular home bill. I learned to crave a Currywurst the way I crave a grilled fresh fish from the Portuguese sea. The enchantment dissipated. And although my sense of European citizenship became the proud label of my twenties… I somehow feel broken into pieces, each of them belonging to a different city, country, corner of the world. “Embora” book cover, photo by http://berlinda.org. Reading back, I spotted many “although’s”. “Obwohl’s”. That’s right, “Embora’s”: meet the title of my book. Because although it is so enriching to live abroad and open up to different places, people and cultures, you also reach a difficult point where you no longer know where your home is. If Leipzig is your home, genieß es bitte für mich.
Embora – Sete anos entre o Norte e o Sul is currently available in Portuguese only, but it will be translated into English if it sells 3,000 copies (no pressure there!). If you’re not a PT speaker and want to support this cause, or simply want to learn this beautiful language, you can get in touch with Débora directly – who will love to hear from you – or order from Portuguese book stores, e.g. Fnac. Additionally, you can join the Embora community.